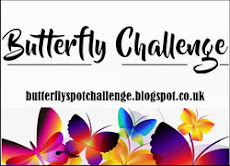 The latest challenge over at Mrs A's Butterfly Challenge is 'Butterflies + A is for Aperture and/or Apricot'. Just one butterfly is acceptable BTW. For what I thought would be a quick card, this took much longer than I thought - but it was good fun to make! So, here we are once again - all ready to play! The sun is shining and maybe, just maybe Summer is peeking round the corner at us. Needless to say, the card isn't quite so pale looking in real life. I love this die set and next time will use the inlay technique as am sure it would look really great. Plus, the frame could be used alone with a sentiment stamped inside - and of course the words, either 'Good Friends' or just 'Friends' could be used without the frame. Very versatile! 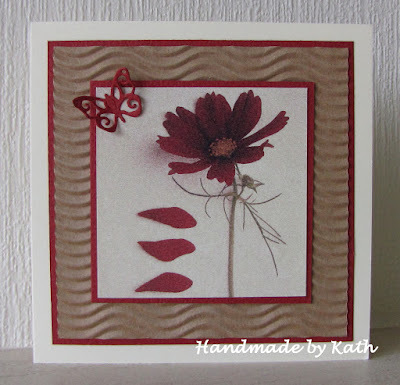 Two reasons for showing you this gorgeous card, made by Lynn (Linby). 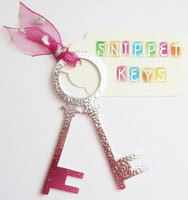 First of all - what a super way to use the left over pieces from die cutting. Shame on me for usually just sweeping mine into the waste bin :( A lovely design and perfectly topped off by the gorgeous flowers. The second reason for showing you is really exciting. 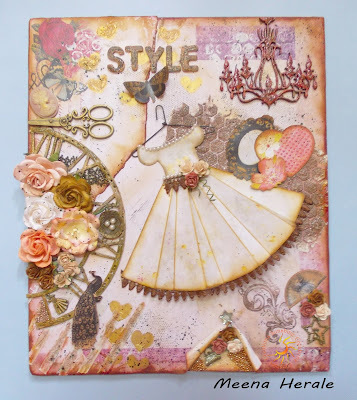 This coming Thursday (at 11am and 3pm), Lynn will be on our TV screens, doing demos for Ooh la la Creations on Hochanda. It's a UK craft channel (for our overseas playmates who might not know). You can read more about it HERE on Lynn's blog. Wishing you all the luck in the world Lynn! Parsnip will be available everyone, selling Lynn's autographs behind the bicycle shed now that we've evicted Sarn! As some of you might already know, due to a prolonged 'frozen shoulder', our Sarn is stepping back a bit from blogging and won't even be playing with us in the Playground :( We'll miss you loads Sarn and hope so much that things improve rapidly for you - these wretched computers have a lot to answer for! I defy you not to giggle at this glorious card, made by Carol L. If you look really closely, that little chap has been partying a bit too much and even has bloodshot eyeballs! Isn't the card sunny - and such a great way to use up snippets too! And another animal card, this time made by Jacky (Paddington Fan). It's hilarious I think - and the funky font sentiment and little music notes are just perfect touches! As for the puddy tat - I can see him ending up with a boot lobbed at him out of a bedroom window if he tries that one during the night! 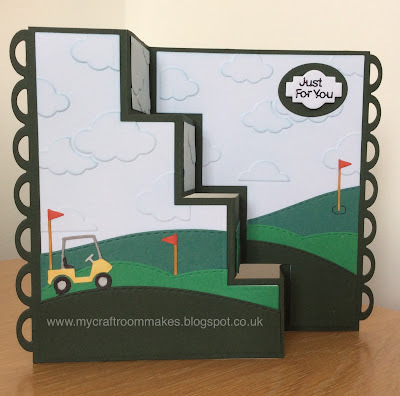 I totally love this golfing card, made by Janice! Such a clever scene and beautifully made. Every little bit of detail is just perfection don't you think. And, to whet your appetite, before too long we have this very same die set up as a prize in the Playground - just as soon as I find time to make my own snippets card using it. It won't be a patch on Janice's card - but there's such a useful link over at Janice's blog showing exactly how she made this card. Lots of tips to be found there! Wowser, what a stunning card this is, made by Sally. Such a wonderful scene (Sally is amongst the very best with her brayer!) and for me the real icing on the cake are the white pen highlights on the elephants and tree. It's often the little details that make such a difference! And using the black snippet to define the top and bottom of the image - so clever. Sandra (Sandma) hopped in with this fabulous 94th Birthday card, made for an Aunt. It's just stunning, so pretty and very personal as well. It's plain to see that a lot of love and care went into this beauty! I love this card, made by Sandra H! Such a lovely image and a really dramatic monochrome look too. 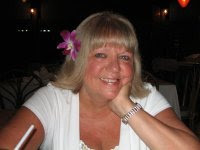 Happy dance here as this is the first time for a long while since Sandra linked in as she's been taking a break from blogging since her beloved husband Dennis passed away last year. Welcome back Sandra - we missed you loads and it's wonderful to see you dipping your toe back in the water again. Huge hugs from all of us! And I'm afraid I have to stop there for this week, as always I could add loads more picks but (a bit like Sarn) sitting at a keyboard isn't the best of things to do when you're trying to avoid aches and pains. And, the previous thumbnails are always there for you to hop back and check out at your leisure of course. No new Playmates this week - unless you count the elephants of course. On spotting Sally's elephant card Mrs A ran screaming into the Playground, yelling that the ducks had taken fright due to the elephants using the duck pond as their new watering hole. Now, bear in mind that I spotted the hysterical hilarious comment before seeing Sally's card - and you might have a bit of an idea of the totally bemused look on my face here! Pen started playing with us in mid-February and this is her first win. Delighted for you Pen and hope you feel the same. I don't have your snail mail address so could you please drop me an email (my address is on the right-hand sidebar) and I'll post your prize off to you this week. The sooner I can post it the better so I hope you see this blog post with you as the winner soon! I thought this might be the week the prize was split, but it wasn't to be - have to say that the comments were in favour of 'winner takes all', but you all had the same odds of winning one or more of the stamps of course! 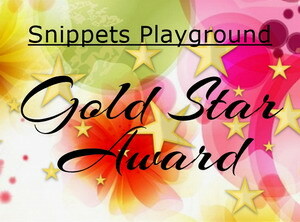 The Snippets Challenge will run for one week and the Playground gates will close at 11am UK time on Saturday 4th June. The gates will open again at midnight UK time on the same day. Here's a little 'heads up' and take notice girls. I have a long weekend off for 'teacher's training' planned so you may well notice that my comments will drop off from the end of this week. I plan to be learning how to put up and also fold down a pop-up tent without rolling on the ground laughing and trying not to wet myself in the process! That means that I'll be embroiled in said tent when I really should be doing the weekly picks and also the draw for the week. In view of our lovely and very supportive pal Sarn's need to rest (thankfully it also means less empties to gather up! ), I can't be in two places at once. So this is the drill, the week will run as usual and let me know if you hit problems linking although some of the time I will be out of touch (bum in the air and trying to light the camping stove no doubt!). The Playground will close as usual on Saturday at 11am - by then I expect to be frying bacon and eggs over the camping stove - having eaten leftover sandwiches the night before whilst reading the camping stove instructions by torchlight until I sort of 'got a grip'. It also means as I said, there will be a scheduled 'new week' with my snippets card, a new Mr Linky and of course prize(s) to be won from Sunday 5th June - but, I won't be publishing the weekly picks and prize draw until the following Sunday (12th June). A maximum of ONE entry and please say in a comment if you wish to play and be a possible winner of the prize. If you only wish to try for the die set or the adhesive eraser, just say so in a comment and if you win then I'll do a second draw for whatever it is you don't want. Please also link back to the Playground in your blog post to be eligible for the draw. Wishing you all a lovely week, with more sunshine, and I hope to see you in the Playground. Psssst: Some of you seem to think I'll really be going camping. Not a chance with my back, I like my home comforts too much! Time for Rudolph Days over at ScrappyMo's - it runs until the end of the month remember! - then it was just a matter of gluing the embossed panel in place and resisting the urge to add any colour or sparkle to the snowmen lest I ruin it! I found four of these ready-embossed snowmen panels, which was a stroke of luck, so I made four identical cards of course. I think I embossed the little chaps when on a Cuttlebug play day at Art of Crafts, years ago! I certainly don't have the embossing folder here so either took the opportunity to use the shop's own goodies which were out for us to play with, or subsequently gave the folder away. I'd like to enter this card into Craftyhazelnut's Christmas Challenge (Anything Goes or Cute this week), and also Craftyhazelnut's Christmas Challenge Extra for May (always Anything Goes). Almost went into total meltdown when I realised that the two stars on the 'Taylor' panel were just slightly out of alignment with one another and I'd stuck them in place using Glossy Accents so absolutely no hope of re-positioning them :( Isn't it always the way, if you're gonna do a boo-boo then you'll do it right at the last knockings! I know it's just a fraction, but it might as well have been a mile at that point in what had been a looooooooooong day! Jane W made a really interesting point recently. With dies becoming more and more intricate we're almost creating our own peel offs when we back card with adhesive sheet and then cut fiddly dies. It look like Little Claire have twigged this and apparently they've got some really great peel offs in stock - who knows, perhaps peel offs are due to return into favour. Hop over to Jane's to see what I mean - HERE. As it's another very important 7th Birthday this week, I'd like to enter this into the current 7th Birthday celebratory challenge over at Allsorts. Well done to Brenda and the team for all your hard work and wonderful inspiration! Time for another fortnightly challenge over at Cuttlebug Mania - and this time the theme is 'Embossing' - either using an embossing folder or embossing using a die. - the next step was to add the sentiment, using the MFT 'You were meant to sparkle' set and SU's 'Smoky Slate' ink pad, having worked out the placement of the flamingo. We've had some lovely weather this week and the Playground is full of activity with birdies nesting and Spike visiting each night to play football with his feeding bowl :) Having said that, today (Saturday as I write this) is just a tad wet! I'd like to enter this card into the current challenge over at Cardz 4 Guyz #120 where the current theme is 'Man's Best Friend'. 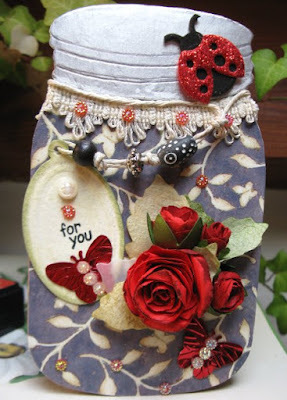 Alice made this absolutely fabulous vintage styled 'jar' which will hold a packet of chocolates - using so many wonderful elements, including what I picked up as a tumble dryer sheet for the rose leaves! I can see from the comments left since I first popped this on my list of picks that many of you also love it - what a clever crafter! Mo hopped over with this really sunny card - it's so pretty and I love it. Really great idea to wrap the organza ribbon across the image. And I also picked up that the plain yellow mat behind the white stamped image layer provided all the yellow flowers and the scalloped circle behind the sentiment. Impressive way to get the most out of one piece of card where the gaps would be hidden anyhow! Do remember that it's Rudolph Days over at Mo's, starting on Wednesday until the end of the month! 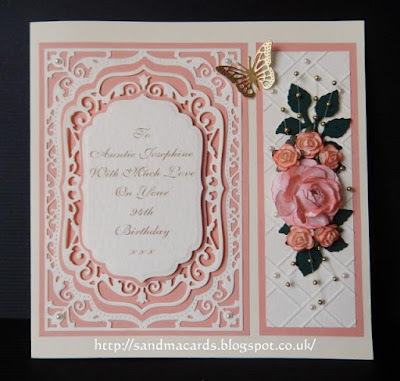 This is such a sweet baby card, and another example of loads of pretty elements being perfectly added to compliment the really cute and beautifully coloured image - made by Karen P.
Brenda always makes such fabulous cards, and this is no exception is it? It really is like looking into fairyland :) And, it's a perfect entry for Mrs A's new challenge which is butterflies (as always) + A is for Aperture and/or Apricot. Ticked all the boxes here B! Gosh, I totally adore this card, made by Heather. Lots of tips and hints over at Heather's blog about the making of this beauty as well! I did get the 'wibble-wobbles' when I read that Heather used her craft knife to cut out the centre of the frame - lil' ole me and knives don't get on, let alone super sharp craft knives! Just had to include this terrific card, made by Sue S! It's such a great design and the 'pièce de résistance' is the fabulous 'pleated skirt fold'. As Sue says, there are plenty of tutorials to be found on line and I'm certainly gonna have a go! This is my last pick of the week, made by Meena. It's a mixed media canvas and the detail is just stunning! So many techniques and different layers - the dress alone is an absolute work of art, constructed totally with 'bits and bobs'. It's all the more impressive as Meena is unable to sit at a regular desk and craft, yet she produces amazing work! I wonder in my comment how long it took her - four days was the reply. To be honest, I'd take more like four weeks and am so aware of all the love and effort that went into this canvas. Meena, you get a big gold star this week! Guess what, we had no new Playmates this week - although 56 of you came to play, which is pretty amazing! I love that you return to play and also that you are so kind and supportive to one another as well. Now, those of you who use Little Claire's Designs stamps will know that they don't go overboard on fancy packaging, but the stamps really are excellent quality. And interestingly, I could be wrong, but having bought these some while ago for the toy box they are larger than the 'dinkie' size they now produce. I think they reduced the stamp sizes in December 2015 and these cuties have been here longer than that :) Anyhow, as I didn't have my own Anna Griffin set to use for my snippets make this week, I thought I'd add the Little Claire's 'critters' in as well. You are very welcome to play for all three stamp sets as one prize if your number is drawn - the choice is yours. The Snippets Challenge will run for one week and the Playground gates will close at 11am UK time on Saturday 28th May. The gates will open again at midnight UK time on the same day. Shame on me, just over four months ago I coloured and die cut a load of Tim Holtz 'Bird Crazy' critters with matching accessories. Used one set for a card, popped the remaining sets into individual cellophane bags and promptly forgot all about them until I was searching for something else the other day. - I wanted to use a particular sentiment (from the Personal Impressions 'Many Greetings' set) to fill in the top right hand corner of the poinsettia embossed panel and as it was a run of four cards the Misti was going to be invaluable. But, choosing the ink to stamp the sentiment was a nightmare! I know I keep banging on about it, but the fine tipped bottles are fantastic - wish I'd bought them sooner. We've had a mixed bag of weather here - although the latter end of the week was warm and sunny in the Playground. It's certainly not time yet to totally discard warmer clothes though! - punched the leaves using a Martha Stewart foliage punch and assembled the little elephant straight onto the card front before adding the flowers/foliage. The Woodware Ultra Fine Tipped glue applicator containing Collall glue was invaluable! I'd like to enter this card into Happy Little Stampers May Anything Goes With Dies challenge. Time for this week's 'peek at the picks' and this has been one of the very hardest weeks ever to choose just a few from all your fabulous snippets makes. I had a very long list of possibles and in the end I closed my eyes and stabbed at the list with my pen! What a stunning bunch of flowers Eve created using snippets! A lovely card and it's so perfect against the white brick wall background too. The current challenge over at Mrs A's is 'recycle and/or ruby red. So far I've been totally stumped here and haven't managed to enter (sigh) but wanted to show you the fabulous card that Kath made using cardboard from a croissant box! Isn't it gorgeous?! 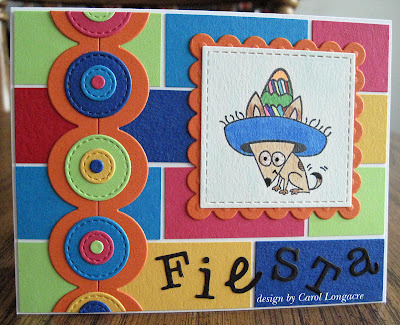 I loved this card, made by Renata as soon as it popped up in the Mr Linky thumbnails. And was blown away when I hopped over to take a closer look. First of all, Renata drew and coloured the poppy herself - without a stamp. She hand wrote the sentiment perfectly and then she did one last thing that I'm still stunned over. See those circles, they were cut by hand without the use of a die! Amazing!! I've seen quite a few similar cards to this one, made by Theresa - at least the idea of the bride and groom hearts part. Isn't it clever - it's been on my list of things to try for ages? Certainly a brilliant idea for a Wedding card, love it! 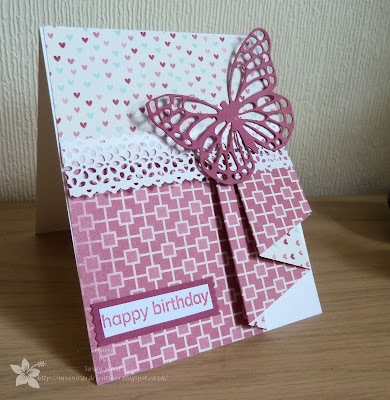 A huge double WOW from me when I hopped over to comment on this beautiful butterfly card, made by Lindsey. Every little piece of the coloured card was painstakingly inlaid into the white butterfly die cut - so pretty, and so worthwhile too! Gosh that was really tough to just have six picks (which is actually double the three I always say I'll show here) and in the interests of still limiting time sat sitting at the desk here I'll stop right there. As always, last week's thumbnails are still there for you to go and have a nose around! Welcome Jacky and we hope to see you again soon. It's been almost seven and a half months since Jane last won, so this prize was well due as well. I still have your address Jane and will post your prize off this week! The Snippets Challenge will run for one week and the Playground gates will close at 11am UK time on Saturday 21st May. The gates will open again at midnight UK time on the same day. A maximum of ONE entry and please say in a comment if you wish to play and be a possible winner of the prize. If you only want to play for either of the sets of dies, just say so in your comment and if you win then I'll do a further draw for the other item. Please also link back to the Playground in your blog post to be eligible for the draw. Hope you all have a lovely week, hopefully with more sunshine, and I look forward to seeing you in the Playground.